My latest project for the Flatiron School’s online verified program is complete! This is my most feature-filled application to date, and it was definitely the most fun to work on. Ok, let’s get into it! 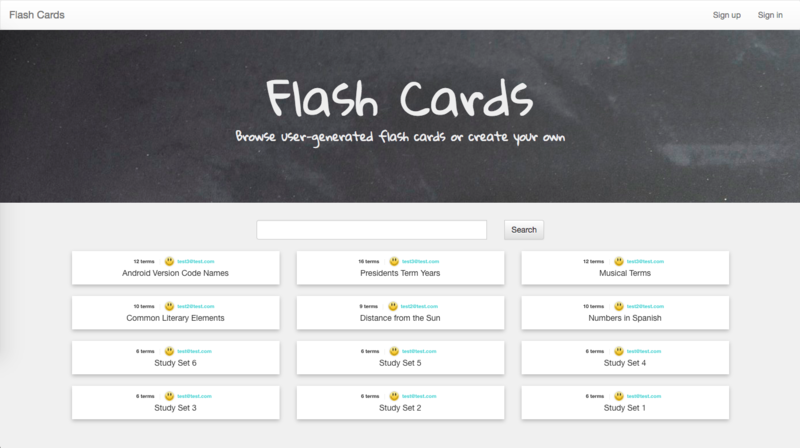 Flash Cards is a web application for viewing and managing sets of flash cards, dubbed “study sets.” A guest can see any study set and view user profiles. A logged in user can create manage their own study sets, organize study sets in folders, and copy other user’s study sets into their own collection. A user can also take advantage of the “study mode” feature. I opted to utilize Devise to manage registering new users and managing sessions. I only needed a user to login with an email and password, and the Devise defaults suited this nicely. Devise also plays well with Omniauth (kinda), which was nice because Omniauth was a requirement for this project. I used Omniauth to enable Google OAuth2 sign-ins. It would have been nice to authorize a single user via username/password OR Google OAuth, but it was a headache that I decided to avoid. Unfortunately in development mode, the client ID and secret key required to utilize Omniauth don’t like to stick around for very long. I used the Dot Env gem to hold my ENV variables. If you decide to use this, don’t forget to add your .env file to .gitignore. You don’t want strangers seeing those variables! This is the relationship between a newly created instance of StudySet and the user who created it. There can be only one owner. Users can see and interact with any study set. At the bottom of every study set is a “Study Mode” button. Whenever a unique user presses that button on a study set, that user is added to the study set’s studiers array. This is why StudySet has many :studiers. Besides the automatically generated Devise controller and ApplicationController, there are four controllers for this app. The first is the Users::OmniauthCallbacksController. This controller kicks in when a user attempts to login by pressing the GoogleOAuth2 link. set_flash_message(:notice, :success, :kind => "Google OAuth2") if is_navigational_format? This was necessary so I could pull the Google profile image from request.env["omniauth.auth"]. UsersController has one lowly action. Devise takes care of the rest of the User-related actions! before_action :authenticate_user!, except: [:show]. The authenticate_user! helper method is provided by Devise to clean up authentication logic. you can pass in an array of exceptions to allow guests to view certain pages. I have that line at the top of every controller. The only thing that changes is what is inside except: . FoldersController and StudySetsController look pretty similar, and they are pretty long. So, instead of sharing both completely, I’m just going to explain the pattern. As mentioned before, user authentication starts at the top, using the authenticate_user! helper method. For some actions, like #create, #update and #destroy, it is necessary to ensure that the current user is the same as the user attached to the model being manipulated. I created a couple helpers in ApplicationController for that. flash[:notice] = "Whoops! You can't go there." Nice and simple! Nothing too crazy there. Now, I want to point out a few extra actions in StudySetsController. Let’s start with #sort. In a study set show page, there is a drop-down select with an option to sort flash cards alphabetically. On change, the sort option triggers the #sort action, pushing the option value to the params hash. Then we have the #copy action. If a user is viewing a study set show page created by another user, a “Copy this” link appears in the middle of the page. When clicked, the #copy action is triggered. The #dup method duplicates all of the attributes of an object. In the case of StudySet, I need to dup the study_set instance and all of the flash_cards belonging to study_set. Lastly, we have the #study_mode action. This is attached to the button I mentioned earlier. For this button, I wanted a different authentication behavior. flash[:alert] = "You must be signed in to use this feature!" If a guest presses the button, the page will reload with a flash alert telling them to sign in. A logged-in user will successfully enter study mode. The add_studiers helper is called, and the :show page reloads, this time displaying an alternate view. Study mode engage, for real this time! The method checks to make sure the current user has not already been added to this study_set’s studiers array. If current_user is unique, it is pushed in. And that’s it! The results of the search will be visible on the page. If the results are empty, the page will show a message and a “back” link.